Nvidia has opened the door to the next generation of graphics cards with the $3,000 GeForce GTX Titan Z unveiled at the company's annual conference. Nvidia has unveiled the GeForce GTX Titan Z graphics card at its annual conference. And, despite offering serious next-level gaming, it comes with a price tag of $3,000. Ouch. The card has a dual-GPU - basically two processers - with two Kepler units and 12GB of dedicated framebuffer memory. In simple terms, this is the most advanced card the famed graphics company has yet produced. 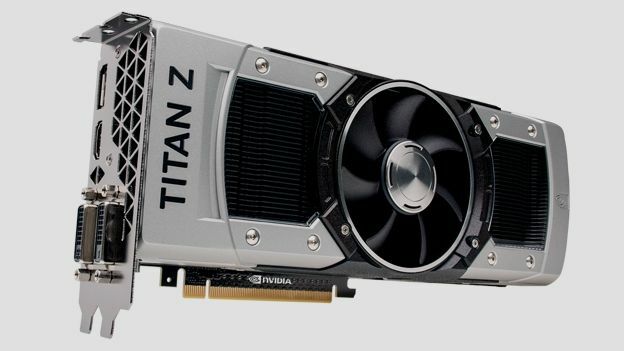 Even though there's no getting around that $3,000 cost for us mortal gamers, Nvidia says the Titan Z will help usher in multi-monitor 5K (5,120 x 2,700) gaming in the future. Nvidia CEO Jen-Hsun Huang unveiled the Titan Z in a presentation focused on gaming but also aimed at power-hungry users looking to render 3D models, create animations or mine for Bitcoin. It works out cheaper in terms of raw performance than Nvidia's professional grade Tesla cards, but anyone buying one purely for gaming will be in for a shock when their credit card statement comes through. The $3,000 price point in the US translates to £1,800 here in the UK. Factor in VAT and other taxes, and you could be looking at £2,000 for a single graphics card - that's Mac Pro territory.